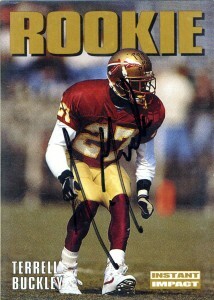 When Buckley came out of Florida State, he had a lot of buzz surrounding him as the second coming of Deion Sanders; Rightfully so since he was a dazzling punt returner and cornerback. 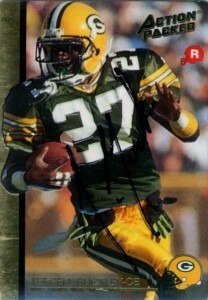 The Packers quickly nabbed him with the 5th pick of the first round of the 1992 draft. He’d have 3 picks and 4 fumble recoveries his first season, and be an electrifying punt returner. He’d average 10 yards a return and be the youngest player in the league to score a touchdown on a punt return. With luck getting quite a few Packers through the mail in those years I made a stab at Terrell Buckley in 1994, his final year with the Packers. Within a month or two I got these two back in the mail. Buckley’s career was underrated to say the least. After three seasons in Green Bay, he headed out for greener pastures in Miami and played there for the next 5 seasons, pulling down 22 picks and 2 touchdowns. In 2000, he’d hop ship for the Denver Broncos for an impact year with 6 interceptions, and then New England for the next two where Buckley would earn a Superbowl ring. Terrell bounced around for the next three seasons playing again for the Dolphins in 2003, the Jets in 2004 and the Giants in 2005, where he retired at the age of 34. Buckley’s statistics are surprising as he had 50 interceptions in his career, but no Pro Bowl appearances or Hall of Fame nominations to his resume. (He currently is the only defensive player in the league with 50+ interceptions not to be enshrined, ranking him 31st all time.) After football Buckley returned to Florida State, where at the time of this post he is working on their staff as a strength and conditioning coordinator. Buckley signs his cards ‘TBuck’, a name affectionately given to him by radio and tv personality Jim Rome.